Played quite a bit of Mass Effect: Andromeda this week and it still seems like the end of the game is far, far away. I managed to complete quite a few side quests on Kadara as well as completing part of the main quest when I retrieved a kett transponder (although it was out of juice). Gil managed to fix the transponder so we now know where the Archon’s ship is – but before proceeding on with the main story I think I want to at least wrap up a few loyalty missions (side quests where you assist your squadmates with their own problems). So, I managed to complete a couple of loyalty missions this week: Cora’s and Vetra’s. Cora’s loyalty mission involved finding the Asari Ark. We managed to successfully find the Asari Ark and help it escape the kett, so now you can see the Asari Ark docked at the Nexus! The Asari who was second-in-command to the Asari Pathfinder was Cora’s hero prior to the mission but after hearing that she intentionally abandoned her commanding officer and endangered the Ark inhabitants by stealing data from the kett, she had a serious crisis of faith. In the end, we revealed the truth of what happened to the Asari Pathfinder to the captain and somehow it came down to the Human Pathfinder (i.e. Ryder) to pick whether the Asari continued to use the current Pathfinder (the one who left the actual Pathfinder to die) or a humble newbie who helped you out during the mission. I chose to go with the newbie considering her heart is in the right place and she has great potential. During the mission, Cora acted as a mentor of sorts for her and she continued to assume this role after the mission too. 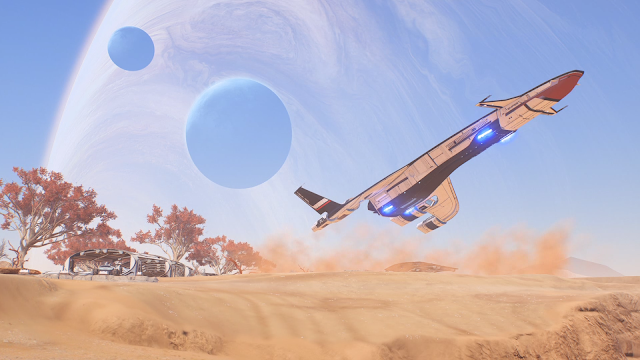 Vetra’s loyalty mission involved helping to rescue some settlers at Sid’s request (Sid is Vetra’s younger sister). The settlers were trapped in an asteroid mine in the middle of nowhere and it, of course, turned out to be a trap. It eventually becomes clear that somebody used Vetra’s credentials and contacts to save the settlers from the same person that trapped them all at the facility, and that someone was Sid. Sid almost gets killed at one point and Vetra is not impressed with her sister as a result. I’m not sure if those two can ever reconcile their differences. One of the more interesting side quests (which is related to you unlocking memory triggers) is the revelation that Andromeda Initiative founder Jien Garson wasn’t actually killed in a tragic accident but actually murdered and it’s all to do with some mysterious person only known as “the Benefactor”. Apparently, the Benefactor was responsible for secretly funding the project and an encrypted message left by Garson suggested that the Benefactor wanted to send people to Andromeda since they knew that something “big” was going to happen in the Milky Way galaxy. Could it be the Illusive Man and Cerberus who secretly funded the Andromeda Initiative? I guess I’ll need to unlock more memories to find out. Another side quest that I liked (and took a good chunk of time) was one where a woman on the Hyperion came out of stasis but was infected with a highly contagious, cross-species virus called TH-314. The captain of the Hyperion wanted Ryder to investigate and to keep the whole affair a secret from the Nexus. So, after travelling around the whole Heleus Cluster trying to track this person down, turns out she crash lands on Kadara. Listening to a recovered audio log it turns out she was planning to commit suicide (since she knew she was in the latter stages of the virus) only to be abducted by the Roekaar. The Roekaar studied her and discovered that the Angarans are actually immune to the virus which meant they could use the virus as a bio-weapon against the species of the Milky Way. After attacking the Roekaar stronghold, the cell leader took the infected woman hostage and said he would let her go only if he could escape with a sample of the virus. I didn’t want to take the risk and was hoping I could save her and take out the Roekaar leader; sadly, I was mistaken and she perished. On the plus side, there may be some hope now for TH-314 sufferers considering Angarans are actually immune to it. In terms of crew drama: Gil and Kallo have resolved their differences after Kallo gave a “peace offering” of sorts to Gil, in the form of the Tempest’s blueprints. Also, I managed to spot poor Lexi drowning her sorrows in a bar after she got hurt by comments Peebee made about her. So wish I could give her a hug, but she’s quite serious when it comes to not dating her patients (and fair enough too). Also, just like Baldur’s Gate and the original Mass Effect trilogy, you can come across a space hamster in Mass Effect: Andromeda. Wouldn’t be the same without one, right? I just wish you could name the thing "Boo". I’m currently on the blistering hot planet of Elaaden where the Krogan colony of New Tuchanka is. This is where I’ll be able to complete Drack’s loyalty mission. When I finally managed to get to the end of Mission 4 (a mission that introduces you to the effects of cold and snipers) I was completely overwhelmed by the number of German troops. Once the German soldiers managed to get within throwing distance, a few lobbed grenades resulted in mission failure. I learned a couple of things from Luke after my first try at the mission though: (1) Half-Tracks don’t act like Humvees in C&C: Generals where whichever troops you place in the vehicle will fire their weapons out of the vehicle all at once (despite the game describing them that way). Consequently, my two MG squads that were sitting in the half-track were not actually having any impact on the battle and their suppressing fire would’ve been really handy. (2) Sinking the German tank pretty much ends the mission. While I did send a mortar barrage on the tank, it was only one and it seemed to just miss. Sure enough, the next time I played the mission I managed to complete it by simply ensuring the German Tank sunk to the bottom of the frozen river (thanks to three mortar barrages). I also managed to finish Mission 5 this week after spending 1-1.5 hours on it (I was playing very cautiously). All I can say is that Katyusha rockets are a godsend as they were effective against, well, almost everything, especially when achieving “veterancy” means you can choose concentrated fire. They aren’t the be-all and end-all though, since tall buildings tends to get in the way of the rockets thanks to the ballistics model Company of Heroes 2 uses. The end of the mission was just a mad rush of MG crews, T-34s, snipers, Guards and Penal Battalions. This’ll be the last time I’ll talk about A Virus Named Tom since I’ve reached my first milestone with respect to this “Pile of Shame” project: I’ve finished the first game off my Pile of Shame list! I was already playing a bit of A Virus Named TOM even before Choona selected it as a game to focus on as I’ve been experimenting with a lot of games in my Steam library that are family friendly couch co-op games, and A Virus Named TOM turned out to be one of them. However, I didn’t really take a look at the single player campaign in great depth at that point and now I’m glad to say it’s finally out of the way. Finishing the last few levels was a hard slog. I also got stuck for more than 45 minutes on a particular puzzle and my wife (who is great at puzzle games) couldn’t even solve it. I eventually looked up an online solution for it since I really needed to know whether there was a solution to the puzzle or not (I actually entertained the idea it was an unsolvable puzzle and it actually required a skip token to pass it) – turns out there was a solution and you could solve it in 25 seconds flat! Anyway, after that episode I had lost faith in the game (since it’s no fun playing a puzzle game if you have to look up solutions to progress through it) and since I had 9 skip tokens stockpiled from previous levels, I think I ended up using 2-3 of them to just get to the end. So, what is the next game Choona has in store for me? World of Goo apparently (another puzzle game… NOOOOOOO!). I actually played World of Goo quite a while ago (the game is pretty old) but remember getting stuck at one point and never returning back to it. We’ll see if history repeats itself when I start playing it next week.